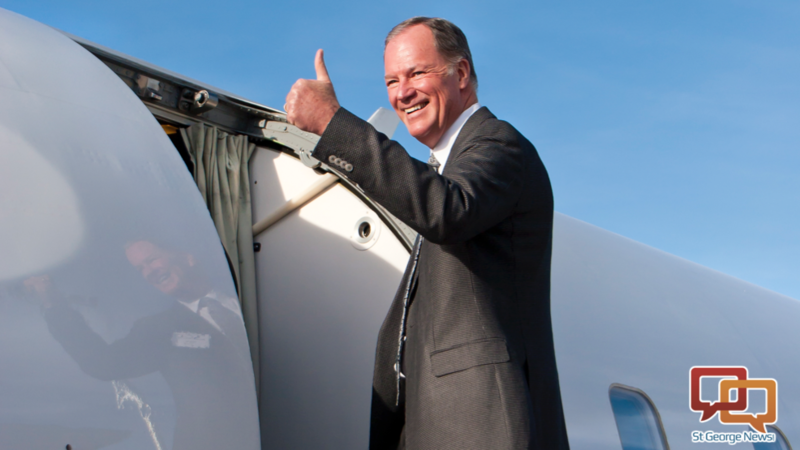 ST. GEORGE – SkyWest Inc. today announced Monday that Chip Childs, the company’s current president, will succeed Jerry Atkin as chief executive officer effective Jan. 1, 2016. Childs was also elected to the board of directors of SkyWest Inc. effective Jan. 1, 2016. Atkin will continue actively serving the company as SkyWest Inc. chairman of the board. Leading this company for over 41 years has been the experience of a lifetime. We set out to do something a little better and a little different than everyone else, and through our commitment to that goal, SkyWest and its people have succeeded immeasurably. My decision to move on from the CEO role was ultimately determined by the strong state of the company and my confidence in Chip’s leadership. I want to thank Chip and all of the leaders of SkyWest, Inc. and our two airline companies. Their engagement and dedication will ensure that SkyWest’s best days lie ahead. Jerry is an icon at SkyWest and across the industry, and I’m humbled and honored to succeed him as SkyWest, Inc.’s CEO. I firmly believe in our mission to be the airline, employer and investment of choice, and will continue to nurture that culture as CEO. The regional airline industry is incredibly competitive, but I believe that as we maintain our focus on our operation, our people and our customers, we will continue to grow profitably and create value for all of our stakeholders. Our collective commitment to these values is essential to the long-term future of this outstanding company. Childs was named President of SkyWest Inc. in 2014 and is responsible for the holding company’s operating entities and all commercial activities. He joined SkyWest in 2001 and became Vice President – Controller later that year. He served as SkyWest Airlines president and chief operating officer from 2007 to 2014. Childs earned his bachelor’s degree in Economics and master’s degree in Accounting from Brigham Young University. He resides in St. George, Utah, with his wife Jennifer. They have three sons and a daughter. SkyWest Inc. was named one of “America’s Best Employers” by Forbes in 2015 and was Air Transport World’s Regional Airline of the Year in 2014. SkyWest Inc. is the holding company for two scheduled passenger airline operations and an aircraft leasing company and is headquartered in St. George, Utah. SkyWest’s airline companies provide commercial air service in cities across the United States, Canada, Mexico and the Caribbean with more than 3,200 daily flights and a fleet of 664 aircraft. SkyWest Airlines operates through partnerships with United Airlines, Delta Air Lines, American Airlines and Alaska Airlines. ExpressJet Airlines operates through partnerships with United Airlines, Delta Air Lines and American Airlines. SkyWest is headquartered in St. George, Utah, and continues to set the standard for excellence in the regional industry with unmatched value for customers, shareholders and its nearly 20,000 employees.